Well, not only does the first of the month mean new sketches and challenges all over the place, but it also means it's time for the October Diva Inspirations Hop from VERVE! Our Diva Inspirations and Release teams are here to start your month off right with a little Verve inspiration! Take a little peek at each of the fabulous blogs below and leave a little comment love for their Verve-alicious eye candy and you just might win some Vervey goodness of your very own! Here's what I've got goin' on for ya'll today--A Mary Engelbreit special! LOL! Not really, I just thought it resembled such after I finished it with my smattering of four different patterned papers and colors and all. This card is actually a Viva la Verve special! It's for October's first sketch and I love it! I used one of my new favorites, the Words of Wisdom set. That mix of fonts is perfection and is totally VERVE at its best! 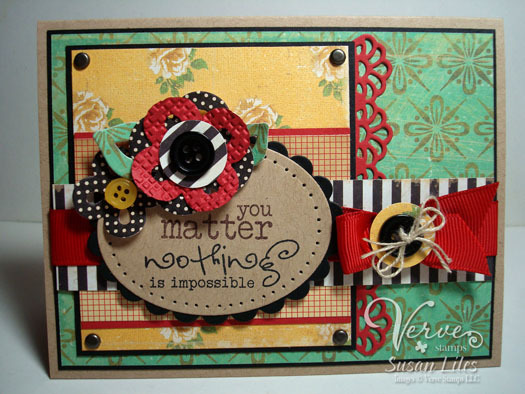 I added a couple of cute flowers with the Loopy Blooms Verve Die, layered a couple of times and embossed on the red one with an embossing folder from SU! that I can't think of the name of. If it were me, I'd name it "paper towel". Anyway, I've got someone in mind for this card that needs a little "pick-me-up". Who have ya'll picked up today? Ok, keep calm and carry on with your hopping onto Charmaine's blog HERE after ya'll take a gander at all the info below. We've hidden a little mystery prize on one of today's hop spots, so be sure to leave a little comment love as you hop around for a chance to win! Susan G Komen For the Cure foundation. A little something for you... a little something for the cure! At 40% off during the month of October, Harvest Blessings is one splendid deal! SUSIE Q-TIP: I hardly ever do the "brad-in-all-four-corners" thing. I was going to sew that yellow panel, but opted for the brads instead. Do some brad-opting of your own. LOVE this Susan! So fun with all those different papers and the layered blooms!! luv the vibrant colors....awesome Susan! I love this card with those bright rich colors! Beautiful, Bright and Cheery! Lots of details and I love the textures! Beautiful Bright and Cheery! Love all the details! Great card! Love all the fun elements and designs. LOL! Yes! I screams Mary Engelbreit! I love this color combination and the touch of the black and white is perfect! Great use of colors and textures! Big and bold a la Susie :) Great card. It is a gorgeous designs! My thought exactly! Englebreit-ish! Very cute! Bright wonderful card! Great colors. Love the splashes of red and black. Soo much detail and texture, great use of color too. Thanks for sharing. what a wonderful combination of shapes and papers! Gorgeous! I love the colors and the pop of red is beautiful and so fun! I loveMary Engelbreit and I love your card! Fabulous!! Great encourager. Nice card someone will enjoy. How cute! It reminds me of Mary Engelbreit! This is so pretty! I love the colors you've used!! such great detail...love the ribbon, border, and buttons...beautifully put together!! Incredible! This is one of those cards that I just want to eat up!! Great colors and love that sentiment! Love your card! 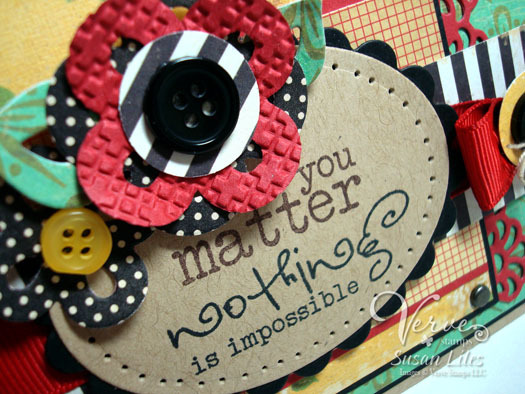 Great details all over...love that you embossed the flower, the brads, the red border punch. Fabulous card. Such a cute, very Mary like card. Wow I absolutely love your card! It is so bright and cheerful and as soon as you see it you SMILE!!! Thank you so much for your sharing and inspiring!! That does remind me of Mary Engelbreit! I like the bold colors. Love all the pops of red and black. Bright and uplifting for sure! I adore your paper choices and your style. The card reminds me a bit of Mary Engelbreit, whom I love! Great work! Great card! Love all the layers and 'bellies! I LOVE this, Susan! I love all the fun colors! Love this bright and cheery card, Susan. The colors and patterns remind me of Mary Englebright! This card has and says Texture! Texture, layers and texture. I just want to touch it. Love texture, your colors are great (of course) but I am really loving the texture (can you tell lol). Thanks for Sharing, Great card! I absolutely LOVE this card! Your color selection and flower layering are fabulous. TFS. Your card is beautiful! I love the colors together! And the red ribbon and the gorgeous bow really adds to everything. The texture on the flower really adds to the flower. But I especially LOVE the sentiment!!!! I also know someone that needs this!! I like the brad idea. Some things are so obvious after I see how someone else has done it! My brads are just sitting in a box. Great card!! I love all the bright colors paired with one of my favorites kraft, and the details! All the different colors and layers - very cool. Love it. Such color and texture. I love it! How awesome, Susan! It does have that Mary Engelbreit feel! Love how cherry and festive this is! Beautiful card! Love the colors together. I especially love the tag. clean! Ooh, those bright colors are so fun! What a lovely bow! What a wonderful message of hope! I love the combination of those sentiments. Ha! I totally see Mary Engelbreit too! This is so fun, Susan. Love the colors and all those awesome die cuts. Beautiful bright and cheery! You packed a lot of "Verve" in here. What a great addition the buttons make. Love all the warm, rich colors, layers,and textures! Wonderful card, Susan! Lovely the funky color combo! Nice card! it IS very Mary Englebreit! And totally yummy! This is a great way to use such bright colors. I love how you balanced it all. Thanks for the inspiration. SO fabulous!! Great colors, embossing, and papers! !